Received this item about six months ago. I didn't write a review in the beginning but have now used this comforter for awhile. I must say the quality is very good and is holding up extremely well. Have had it drycleaned and it still looks like new. Good purchase for the money. This quilt set is woven from one hundred percent cotton on a jacquard loom. 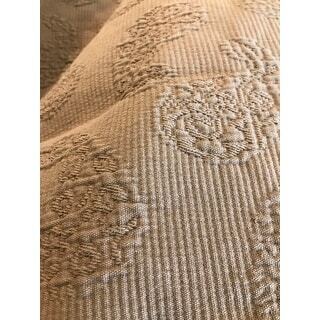 Features a textured matelasse paisley pattern that gives the blanket a feeling of weight and texture and bound corners to prevent fraying. Available in multiple colors. I bought this bedspread for a King-sized bed in Queen size. I needed it for an "under spread" because the quilt I use for a spread was not big enough for my new tall mattress. The color is perfect, the weight is light enough for summer & of course, 100% cotton can't be topped. The shams were a bonus, didn't really need them, but use them nevertheless. The color is such a perfect match for the colors in my quilt. This bedspread is perfect for the summer! It is thin enough to use over a light blanket. The paisley print is a bit understated but exactly the look I was going for, although I ordered black. It might be more noticeable in the other colors. I love the look. Best part is this bedspread is extra generous in size! I can never find ones to fit my bed but this not only fits, it gives me a little extra. Be sure to check your measurements. The price is wonderful - you may want to order more than one color! Love the 100% cotton, and the deep navy color. Totally recommend, because I love the natural fiber bedspreads. The color choices were great as well. Only small problem is a very slight fading from washing because they are all cotton. Still recommend this product. And love the paisley imprint!!! Gorgeous coral color that is light weight as I had hoped. I wanted to layer with light blanket underneath and it’s perfect! The color is vibrant and brightens the room so much that sometimes I think I’ve left a light on! However, I’m glad I read the reviews when choosing a size. I went with the full size spread for my queen bed thinking it may let some of the bedskirt show. No! It fits like a queen bedspread. Goes all the way to the floor on all 3 sides and no bed skirt shows. I’m actually tempted to use it as a coverlet on my master bedroom king and let my bedskirt show. Haven’t tried it yet but I know it will work. Oh, and really don’t notice the paisley pattern unless I’m standing right over it. All you see from a distance is beautiful color! Very happy! It's no bargain at $*** but no ripoff either. The fabric is not as substantial a matelasse as I'd hoped. Every little wrinkle on the bedding (sheets, blankets) underneath the spread shows through; I've had to up my bed making game. It will, however, make a nice lightweight blanket if I ever find a better navy blue spread. A note on the navy color: Every bit of lint shows, and the spread doesn't want to let it go. I'm not obsessive or anything, but it's so bad that I've been using the sticky lint roller on it every day. 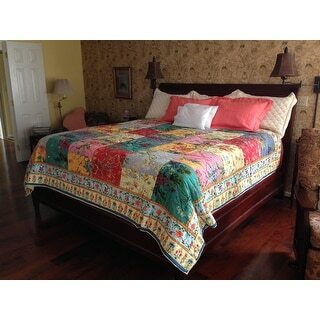 This is a beautiful cotton bedspread. 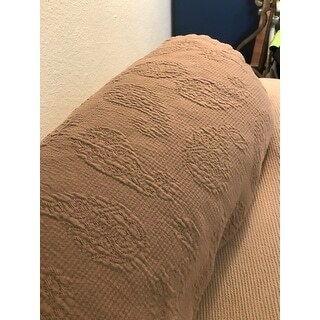 I use these to cover my sofas as I have pets. They work great. Wash and dry without problems. I am really enjoying this bedspread. Bedspreads are very hard to find and this one is oversized. It is light weight just enough for our Texas weather. I've purchased this bedspread and have never purchased one before but I absolutely regret not getting this item sooner! It has the perfect weight to it and the grey is just perfect. It is extremely comfortable and super cozy. The pattern is not overbearing and looks stunning on your bed. 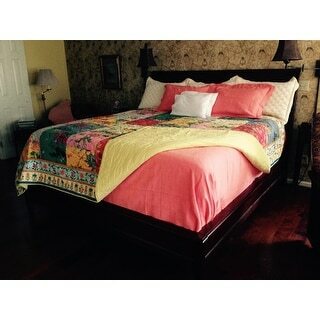 It's gives such a classic finish to my bedding ensemble that I am so in love with my purchase. This seems like a really high-quality Matelasse. Since I have a dust ruffle on the bed (queen size) and my bedframe is low-profile, I ordered the bedspread in Double, rather than Queen size as I had read reviews that it runs large. Very accurate. I am using it as a quilt/throw rather than a bed spread. That way the dust ruffle still shows around the edges and spread does not drag on floor..
Nice oversized spread. There were a few spots which looked like the spread had brushed against a weak Clorox solution. Since the spread is so big, we have not had to use the shams. Nice looking and just the color we wanted. Washes and dries in commercial machines just fine. I take them out before completely dry to lessen shrinkage. Sturdy material in a neutral color. 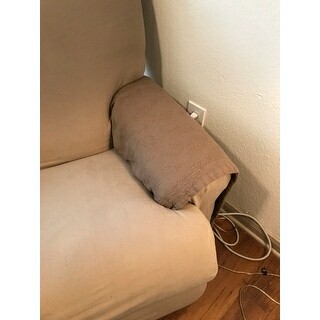 I am using it to protect the arms of my couch and chairs and plan to make a couch cover out of it. It’s not too thick and I really like the pattern. Other reviewers mentioned using it as a couch cover to keep pet hair off the furniture and that played a big part in my decision to buy this. Loved this. Has held up for years. great quality. I am very happy! Love the color and the feel of the fabric! I purchased this set in the green shade. It's beautiful. I would absolutely recommend this set! Love this bedspread so much that I’m planning to order in another color. It washes well in cold water and is extremely soft. Found my bedspread to be just as ordered... good material and looks great. "where's the coral colored item?" "How much does the queen size weigh? I need a light weight for summer. If this is too heavy, can you reccommend another? I really had searsucker (no lining) in mind." This is light to medium weight. I liked the measurements for my bed. "How is the pattern made in the fabric? Is it stitched or some kind of heat-molded or pressed design?" "How do the shams close: buttons? zippers? Where is the closure located: bottom? side? Thank you"